There are many and varied stories relating to the origin of the pretzel, at best I can conclude that they started somewhere in Europe a really, really long time ago. Nowadays it is pretty much accepted that they belong to Germany. There are a number of different methods to achieve the chewy brown crust, I boil mine in baking soda and brown sugar. Traditionally, pretzels are dipped in an extremely caustic solution of lye – boiling water is hazardous enough for me. Pretzels are a great snack or side for soup. Put warm water, yeast and sugar in the bowl of a food processor and allow to stand for 5 to 10 minutes, or until yeast is foamy. Add flour and salt to the yeast mixture and pulse to combine, then process for about 30 seconds or until the dough pulls away from the sides of the bowl. Turn out into an oiled bowl and let rise for about one hour. TIP – at this point the dough can be refrigerated (or frozen). Ideally in a zip top bag or bags for later use. Cold dough must sit at room temperature for at least two hours before moving on to the next step. Divide the dough into four pieces. Using your hands and a lightly floured surface, roll each dough piece into a long snake shape, about one inch thick. 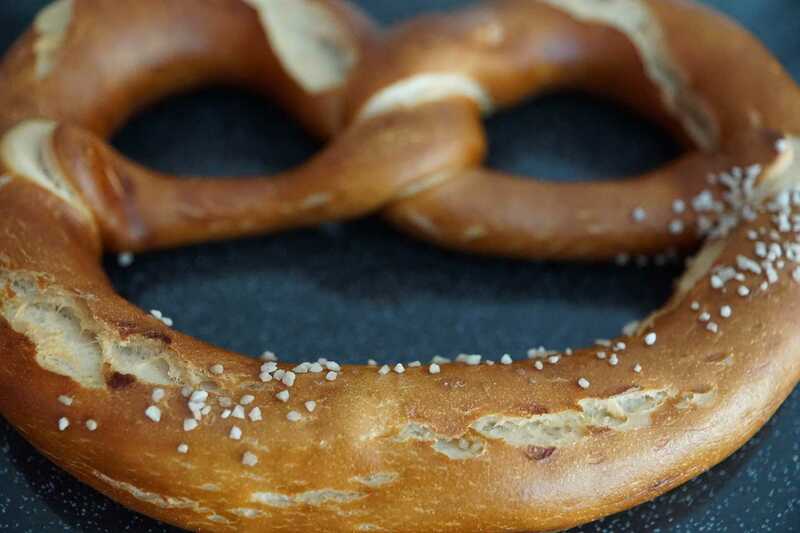 With a dough cutter or knife, cut the dough snake into bite size pieces, or longer pieces to twist into a pretzel shape and set aside. Keep the cut pieces dusted with a little flour and covered with plastic while you work. Continue with the other three pieces of dough. Allow the dough to sit under plastic for about 20 to 30 minutes to rise. Meanwhile, boil 8 cups of water in a large pot. When the water boils add baking soda and brown sugar. Scoop the pretzels out when they float to the top and place on the baking tray. Continue with all the bites, scooping onto the baking sheet. Once all pretzels are boiled, spray with vegetable oil spray and sprinkle with coarse salt. Bake the pretzels for 13 to 15 minutes, or until golden. Storage: store in an airtight container for 1 – 2 days.